What happens when you cross a venerable, century-old boatbuilding establishment like Broom Boats with Graham Warren, formerly the head of Targa design at Fairline boats? How does iPod docks, an arching chaise longue and vibrant splashes of lime green upholstery in the trendy owner’s cabin sound? However, old school Broomites heading for the hills muttering words of sedition, please take note: as our extended two day test in June proved, Broom’s latest and greatest is far from a simple case of out with the old, in with the new. Although the modern makeover inside is the 430’s most manifest aspect, the workings of this aft cabin, raised deck, single external helm cruiser are fundamentally the same as Broom’s boats of yesteryear, and that is something to be thankful for. 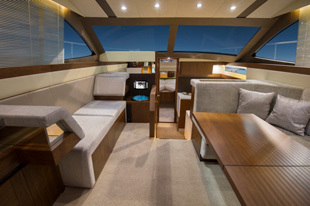 So 430 owners can still look forward to the joys of an elevated deck arranged on a single sociable level, free of the onerous shuttling up and down steps that a flybridge cruiser would demand of its passengers. 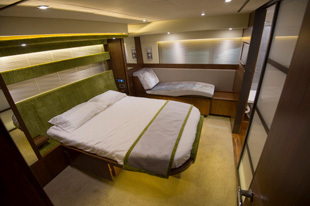 Although the new handle-free style disguises the fact, below decks storage is still very reasonable, although as is often the case with this genre of boat, with no lazarette to call upon deck stowage is very limited. Broom could have done more to improve engineroom access, the aft cabin boat’s other weak spot, although this is only a big GRP hatch and a pair of gas struts away. Faced with a stiff breeze and a blustery chop, the Andrew Wolstenholme designed semi-displacement hull acquitted itself well. Despite the bluster, it provided a largely dry ride. The 430 turns exceptionally well, far quicker than you might instinctively expect a hull with a long fixed keel to do. Fitted with twin 370hp Volvo shaftdrive diesels (330hp & 435hp are also available) we achieved 24.5 knots flat out with a full tank of fuel and four crew onboard. Our engines were under-revving by 70rpm, but whether better full-rev props could bring the 430 into line with Broom’s 27 to 29-knot claims remains to be seen. Whatever the 430’s speed, from fast cruising to inland waterways pottering, the boat is a joy to drive, thanks to terrific visibility and a simple but outstandingly effective dash, complete with old fashioned practicalities such as a proper chart area. Before we made it out into open sea at Lowestoft, the first part of our test involved a three-hour meander up the river Yare from Broom’s yard in Brundall. This trip confirmed that the 430 would also perform admirably as an inland waterways cruiser. Although our boat sported the optional hardtop, the conventional open 430 has a hinging mast which can rapidly reduce the air draft to a bridge friendly 10ft 10in (3.30m). And an assortment of zippered canopies allow the 430 to go from completely open to fully enclosed in a matter of minutes, so the unpredictability of the British climate poses no problems. For those who never intend to use the 430’s evident offshore abilities, Broom can fit a single 370hp diesel in place of twins, ergo far better fuel economy and engineroom machinery access. Broom understands that the 430’s modern makeover may not suit everybody, so with this in mind it has an alternative Classic styling in the pipeline. But whatever the style, what remains is essentially an extremely versatile cruiser.